The wabi sabi Japanese aesthetic evolved mainly in townspersons circles. 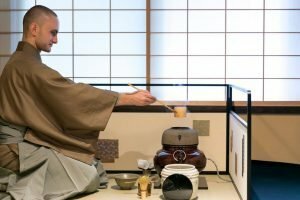 These merchants infused the rite of tea, as it was practiced in elite warrior society, with Zen Buddhist modes of thought and worked to a more down-to-earth, simplified version of the practice. 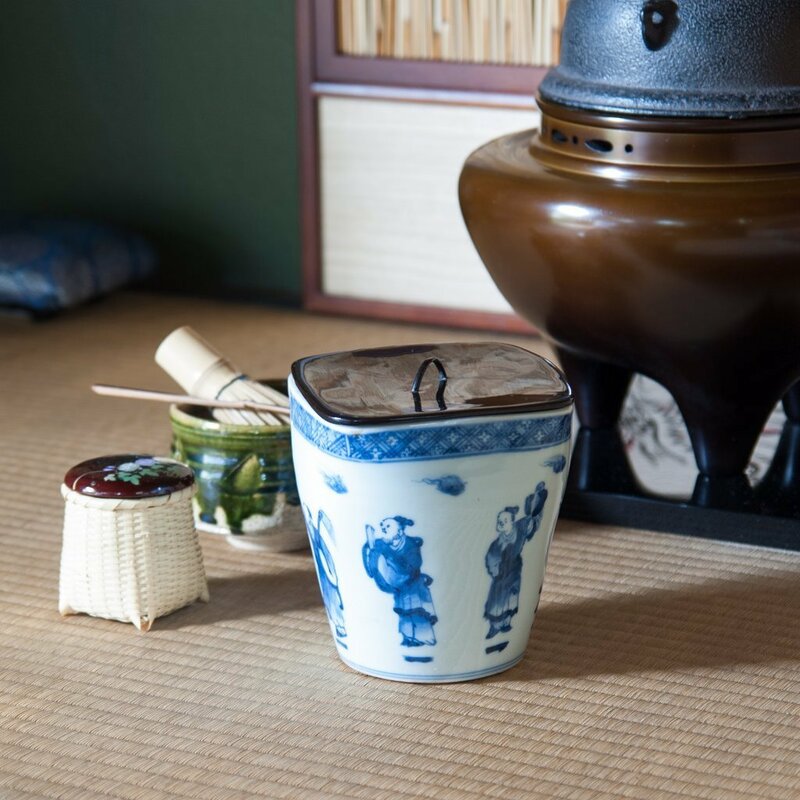 This marked the evolution from shoin-style tea to a more accessible, rustic wabi-style tea. After the unification of Japan under the Tokugawa shogunate, the practice gradually regained popularity with feudal lords and members of the warrior class. These practitioners of the rite of tea built further on the Japanese aesthetic of wabi, and added to it a sense of more distinct beauty and courtly elegance. This style later came to be known as kirei-sabi. Hosokawa Sansai, a direct disciple of Rikyū, used a similar term in the introduction of his ‘Hosokawa cha-no-yu sho’. To live eagerly and with full intent day and night, morning and evening, is what it means to be a person of refined taste [sukisha]. Make a good choice of utensils to bring out; turn your resolve to a wholehearted focus on appreciating and choosing the beautiful [kirei-zuki]. Don’t get coiled up in superficial things. There is no such thing as seniority in the rite of tea. It is the connoisseurship of a true master alone that determines someone’s proficiency in the art. The word here used for ‘beautiful’ can be interpreted as ‘charming as thin twilled silk fabric; the elegance of an object’s shape or color; a chaste, unclouded appearance; a purity of heart; a gallant, tidy demeanor; a freshness without residue.’ Additionally, the second character of the word kirei carries the meaning ‘heartwarming, well-proportioned beauty’. 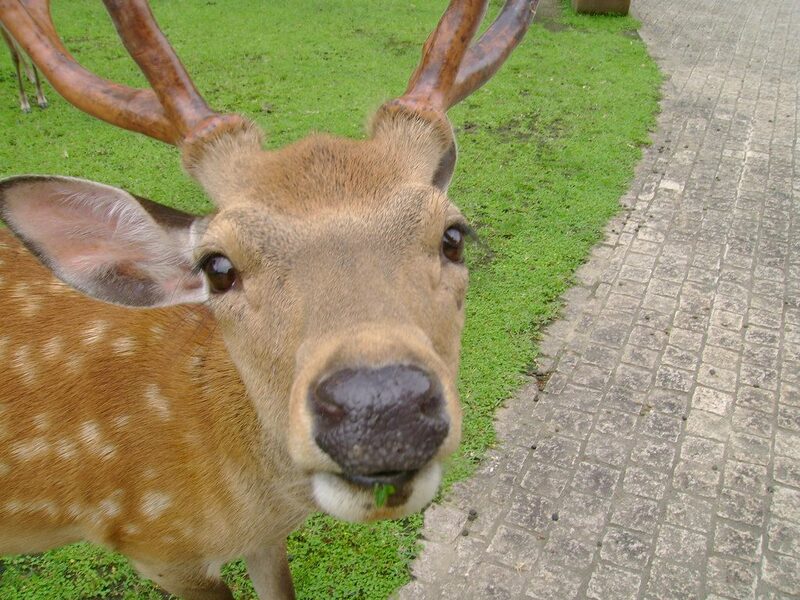 The character originally developed from the image of both horns perfectly aligned on the forehead of a deer, and alludes to the beauty with which deer tie together in a row when they transgress the open plains. Sansai’s kirei-zuki-style of tea developed on the foundation of Rikyū’s spiritual-minded mode of tea, to which he added a focus on the element of ‘beauty’. The initial years of the Tokugawa hegemony marked a time of peace and a revival of important cultural practices. It is this time of peace that allowed Sansai to develop a less tense, more relaxed style of tea. On the other hand, his contemporary Furuta Oribe favored the style of unbound innovation [sōi-kufū] that was practiced prior to Rikyū’s time. His tea was infused with a uniquely distinct sense of beauty. This awareness is said to have grown from his effort to uphold his rank as a member of the warrior class in his practice of tea. Kobori Enshū is said to have completed the kirei-sabi-style. During his childhood years Enshū trained in various arts and scholarship including Zen, Confucianism, and Nō performance theatre. He was schooled in literary works of art as the ‘Tale of Genji’, ‘Tossa Nikki’, the waka verses by Fujiwara Sada-ié, and many other works of court literature. He was a well-respected and often called-on architect and contributed greatly to the construction of parts of imperial palaces, castles and gardens. His wide array of skills and interests connected him to a broad network of high-ranking nobility, clergy and shogunal vassals. His education in the rite of tea he received from Oribe, whom he also succeeded as official tea ceremony instructor to the shogunate. Enshū was deeply impressed by how a poem by Sada-ié enlightened Jōō on the true meaning of wabi sabi. 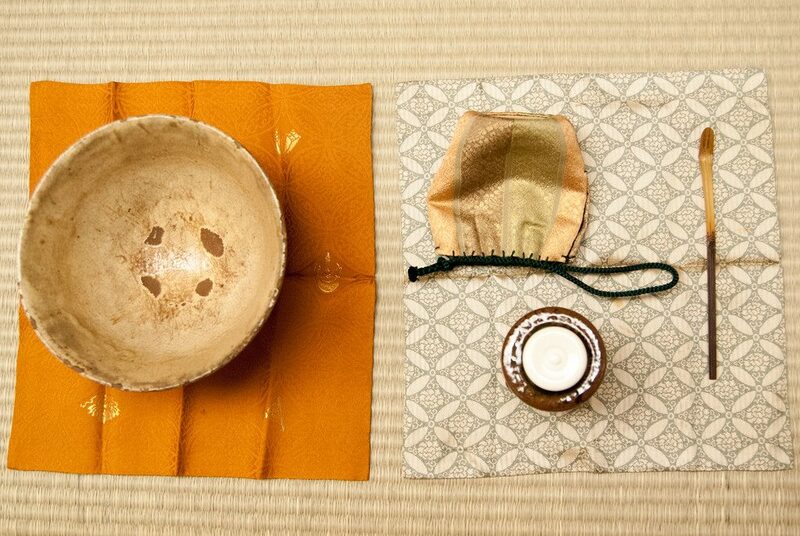 Moreover, Enshū’s fascination with cleanliness and purity is said to have its origin in Shukō’s ‘text of the heart’. The text deals with the importance for a tea practitioner to constantly tend to his emotional problems, and maintain a pure heart at all times. 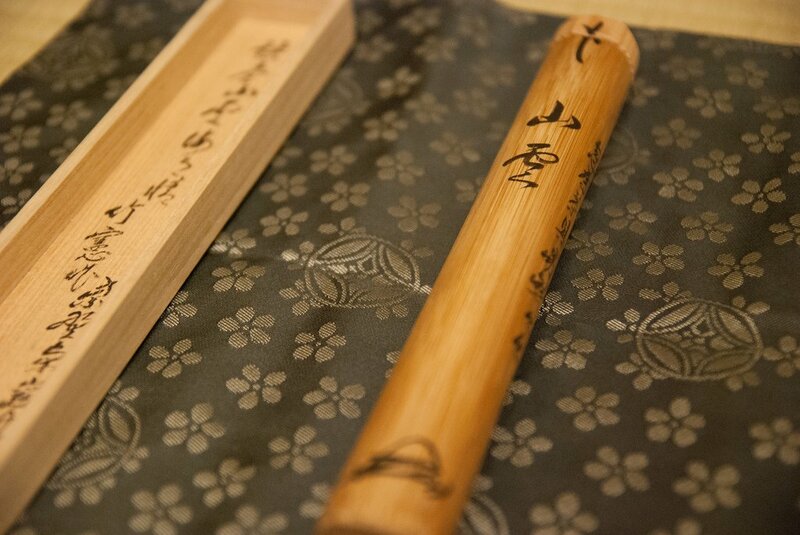 The focus on cleanliness from within, guided Enshū’s aesthetic taste to the selection of implements that are likewise permeated by a sense of elegance and purity. And, this complementary focus to the pre-existent wabi-style of tea eventually resulted in a renewed mode of preference for a tea person’s choice of utensils. The objects chosen or preferred by Enshū came to be known as chūkō meibutsu, a term used in differentiation from Rikyū’s choice of Ō-meibutsu that majorly consisted of karamono. Below I will continue to introduce several aspects that are illustrative of Enshū’s kirei-sabiJapanese aesthetic. The Japanese aesthetic of kirei sabi at Bōsen at Kohō-an in the Daitokuji temple complex. The formal size for a tea chamber in the wabi-style is 4.5-mats large. This is the standard size for a tea chamber of the sōan-kind (a rustic thatched hut). These compact solitary buildings were built in opposition to the custom of elite warrior tea practitioners to enjoy tea in lavish grand reception rooms (shoin-style). The sōan-style was further distanced from the shoin-style when tea masters as Rikyū began to favor and implement a daime layout for their sōan tea pavilions. 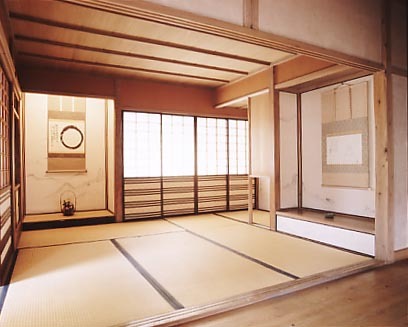 The shoin-style is distinguished by the use of a daisu (grand-sideboard) for the preparation of tea, the depth of which is commonly one-fourth of the length of a standard-sized tatami mat. 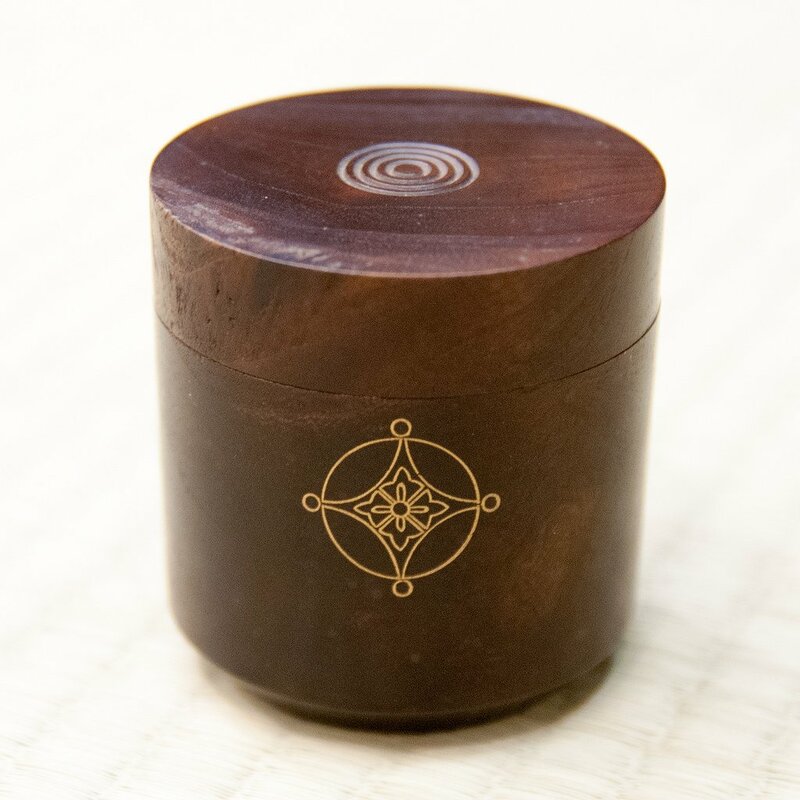 The daime application for those rustic wabi-style tea hermitages simply consists of shortening the length of the mat used by the host for the preparation of tea by one-fourth: exactly the size required to bring a daisu into the chamber. In doing so, wabi tea practitioners made the decisive statement that their tea now is a complete antithesis of the shoin-style. The wabi sabi Japanese aesthetic however developed in mainly townsperson circles. Enshū, as well as his teacher Oribe, were fairly powerful members of the warrior class. And, this is perhaps the foremost reason for their intent to bring elements of the shoin-style back to the rite of tea. 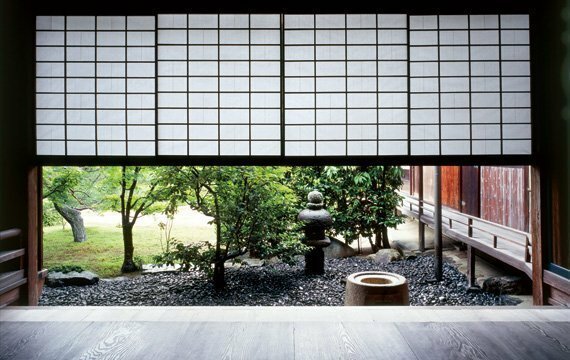 While the basis for their praxis of tea existed in the wabi aesthetic, the shoin style provided Enshū with the possibility to make a statement about his ancestral roots and the social status of his family. 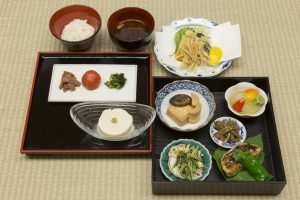 Records of tea gatherings hosted by Enshū indicate that he often used sōan-style tea hermitages for the first half of a formal tea occasion; the service of a kaiseki meal followed by thick tea [koicha]. And then for the second half he guided his guests to a larger shoin-style chamber for the remainder of the event: thin tea [usucha]. This is a convention that nowadays is still strongly present in the practice of Enshū-style tea. The culmination of Kobori Enshū’s architecture for tea can be conceived in his Mittan tea hermitage at Ryūkō-in, a sub-temple of the Daitokuji complex in Kyoto. This particular tea chamber contains shoin-style features such as a set of recessed and staggered shelves [chigai-dana], and a built-in windowsill floor-desk [tsuke-shoin]: adjuncts of a display alcove [toko-no-ma]. The layout of the chamber however is maintained in the sōan-style through the implementation of a daime structure for the segment of matting used by the host for the service of tea. The chamber also carries the uncommon feature of housing two display-alcoves; a very large one as was common for shoin tea chambers, and a smaller one, the standard size for sōan-style tea hermitages. This allowed Enshū to devise a greater variety of possibilities for displaying valuable objects in the tea chamber. Some of his constructions are for example the exhibition of a scroll or an incense burner on the shelves or writing desk, or the demonstration of stationery items as ink stone boxes and valuable writing brushes. Kobori Enshū had a thorough education in court literature and poetry, and throughout his life connected with many of the nobility. This refined his taste for court culture and deepened his overall interest in applying such modes of fashion to his style of tea. Moreover, Enshū was intrigued by Jōō’s choice of waka poetry to describe the underlying emotional understanding for the wabi sabi Japanese aesthetic. In fact, not only did Jōō express his understanding of the concept through a waka verse, he was also the first person to decorate the alcove with a scroll containing the following waka composition by Abeno Nakamaro from the ‘100 poets, 100 verses’ collection calligraphed by Sada-ié. Looking up at the limitless magnitude of the sky, the moon rising. Is this the same moon as the one that rose above Mt. Mikasa at Kasuga shrine? After this occurrence it became uncommon to use waka poetry in the tea chamber until Enshū redefined the concept of what could be employed and displayed. And, it is said that Jōō’s selection of waka as an element of his tea greatly influenced Enshū’s choice to initially employ poems from the ‘100 verses, 100 poets’ collection written by Sada-ié. Later, Enshū resolved to learn Sada-ié’s style of calligraphy, and eventually became so proficient in it that his writings were hardly distinguishable from the ones by the hand of the famous poet. Enshū’s application of court literature and waka verse didn’t limit itself to use in the alcove only. Through studying the essence of Sada-ié’s poetry Enshū grew eager to apply this form of condensing human emotions into verbal expression on naming utensils for use in the rite of tea. He felt that this would add literary sentiment and the breath of life to those implements. This is the origin for many of the poetic names [uta-mei] he selected from the 6 imperial commissioned poem anthologies ranging from the ‘Kokinshū’ to the ‘Shin-kokinshū’. Through his many interactions with members of the aristocracy, Enshū cultivated an understanding of- and appreciation for court language, lifestyle and customs – cultural elements that at the time weren’t available in warrior society. But, this wasn’t merely one of his personal adorations. After countless decades of war and bloodshed peace had now returned to the country. In order to maintain this calmness, Enshū understood that it was necessary to put practices in place that would allow people to relax. He had found this element of relaxation in the refined culture of the aristocracy. His position as magistrate of construction works in Kyoto demanded that he also learned the traditional shinden construction techniques of the court. And, it is believed that through studying these architectural patterns – carefully positioned around a central garden – Enshū discerned how such structures could guide people to broad-mindedness. Consequently, in most of the gardens and buildings he designed, a co-existence between warrior severity and courtly spaciousness can be sensed. Chūkō meibutsu is a term that was first taken in use approximately 140 years after Enshū’s passing. It was Matsudaira Fumai who in the introduction to the ‘kokon meibutsu ruiju’ [a systematization of ancient and modern masterpieces] defined the term. During the time this text was written, meibutsu [august masterpieces] was a term used to refer to tea implements that were named and favored during the golden years of the rite of tea during the final decades of the warring states period in Japan. It was mostly these objects that were preferred by adherents of the Japanese aesthetic of wabi sabi as Rikyū. However, a large majority of famed implements were lost during wars prior to the unification of Japan under the Tokugawa regime. The time of peace under the Tokugawa hegemony sparked a greater interest in the rite of tea among feudal lords, since the absence of war allowed them to engage in more leisurely and refined pursuits. Simultaneously, the demand for antique resplendent masterpieces skyrocketed, but the supply was at an all-time low. 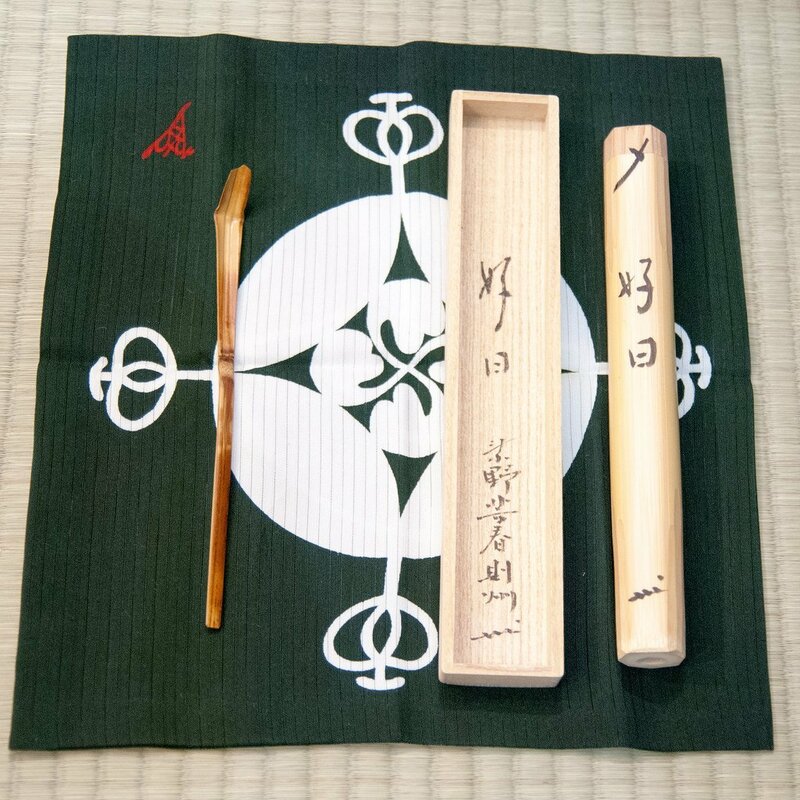 To feed the hunger of these newborn tea enthusiasts, Enshū assumed the task to curate, collect, and introduce a new range of majestic tea implements. 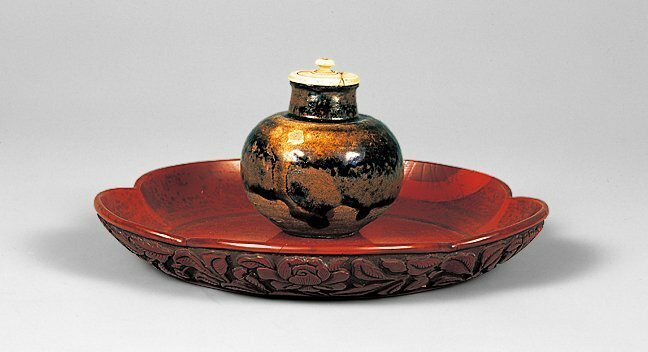 While the previous collection of meibutsu consisted of mostly Chinese antiques known as karamono, Enshū selected utensils that were either fabricated in Japan, or were brought to Japanese shores from China, Korea, or the islands situated south of Japan, during the 13th century. It is from this collection of antiques that Enshū chose implements that seemed appealing for use in the rite of tea, and created a new line of pedigreed objects. Fumai, in his definition of meibutsu, recognizes the existence of a second tier of august masterpieces curated by Enshū, and therefore calls for new terminology. To distinguish between the meibutsu from the late 16th century, and Enshū’s renaissance of masterpieces, he decided to rename the former to Ō-meibutsu [grand antiques], and call the latter chūkō meibutsu [renaissance masterpieces]. In doing so, he favored neither one over the other. Both tiers exist as meibutsu. The only distinction that needed to be made is a reference to their time of creation. Black mulberry tree nakatsugi tea caddy with Kobori family crest. 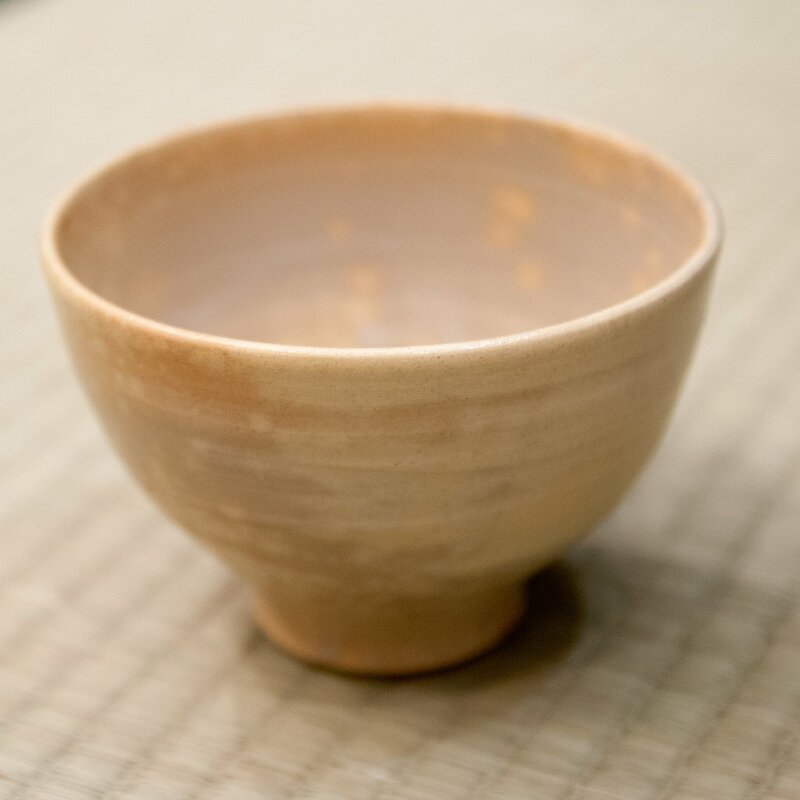 Asahi-yaki tea bowl in the Japanese aesthetic gohon style. Hakeme tea bowl and Tamba-ware pottery tea flask. 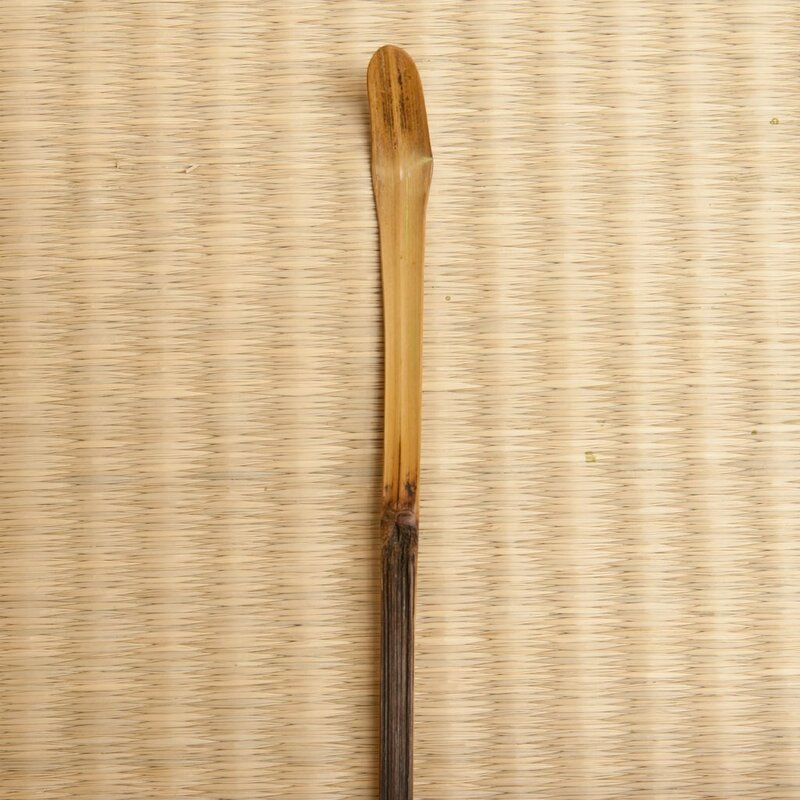 Tea scoop: Warrior-style ‘insect bite’ tip. Arrangement of aesthetic Japanese utensils for summer. The practice of naming favored utensils existed in China, and was continued in Japan especially among adepts of the rite of tea. Conventions for naming objects didn’t exist, and therefore vary greatly. Common methods for naming included classification by the shape of the vessel or the style of its glaze; the name of its owner; a term that alludes to another object with related nomenclature, etc. It could be said that the awareness about donning important objects a name bears similar significance to the feudal practice of elevating the status of a nameless commoner by allowing him to assume a surname. The object would in similarity rise in qualification and appreciation through the addition of its label. Enshū mainly made a selection for his chūkō meibutsu collection from antique Chinese karamono, seto-wares from the old and contemporary kilns, and other contemporary pottery kilns. He also favored objects that were manufactured outside of Japan in, for example, Korea. But, he went as far as countries as Vietnam, and even placed orders with potters in Delft in The Netherlands. His renewed selection of antiques provided the growing numbers of tea adepts with a wealth of objects to admire and collect. Enshū didn’t stop there. He continued his personal pursuit of the beauty by advising national kilns on shapes, glazes and clays. 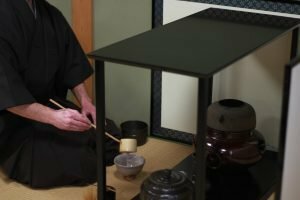 Eventually, his personal style and aesthetic preference inhabited all layers of the rite of tea, leaving a distinct mark on the history of the practice as a whole. His influence ranged from garden design and architecture, to the new creation of implements for use in the service of tea. Tea scoops, flower vases, tea bowls, etc. were affixed with motifs and forms of his choosing, and are the most important source of information we contemporarily have to begin understanding not only Enshū’s aesthetic preferences, but also his style of tea as a whole, and his outlook on life in extension.